Children – many already speaking of different tribes as the “other” and in insulting terms. This sows seed for future divisions, as unless these kids are educated to change their attitude, they will carry this into their adulthood – causing much problem in 10/15 years time. 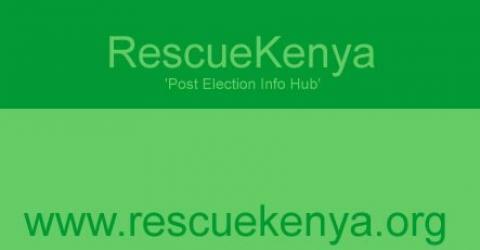 www.rescuekenya.org has been accepted as CCP’s communication hub. Much information is collated on the site and all are invited to view, contribute and make this a comprehensive data point. Mombasa – Balala got group together to restore and maintain peace at the coast. It consisted of a comprehensive mix of all major stake holders – Traditional and provincial leaders, councillors, politicians, private sector, religious leaders. They held meeting to discuss peace and development. The meeting was self financed by local companies who raised Ksh 100-150,000 for the purpose, and committees have been set up to work on issues as they arise. The same is needed for Nairobi. A forum needs to be set up and chaired by new Metropolitan Minister. Like Msa it needs to bring all groups together to plan welfare and development of Nbi. Kriegler commission and others commissions have all indicated that none of them are going to explore or pronounce on who won the election, as it is not in their mandate. High likelihood that we will never find out. Chair of Mediation team needs to be more proactive in informing public as to status of discussions. Need to hear more from them. What are they debating? where have they reached? Greater profile and media focus required to keep Kenyans informed. Conference on business sustainability taking place Tues next week – Amb Kiplagat is main speaker. CEO’s of all microfinance organisations have been invited to attend. Discussion will be on conflict anticipating strategies as well as alleviating current situation. a). We produce a publication called Forced Migration Review 3-4 times a year containing articles from academics and practitioners about the most current issues. This is the most widely read publication on forced migration, distributed free of charge to a global readership of c.15,000 and is entirely funded by donors. It might be a useful vehicle for an article by Citizens for Peace. bursaries to offer, particularly to participants from the global south. This may be of interest to some of your members. A great Coalition for Kenya needs to be set up. Rather than civil society acting in opposition to Govt how can we set up so that it partners and seeks to help ensure activities to help Kenya and Kenyans take precedence over the next 5 years? A non-paper needs to be prepared on pooling resources and creating a common agenda/consensus for rebuilding the nation.